Planning a wedding is a huge undertaking – as any former bridezilla will tell you. Finding a caterer, a venue for your date, dictating exactly the kind of music you want to a DJ, and choosing flower arrangements may sound fun, but really takes a toll on the nerves of the poor couple tasked with these jobs. And all of it costs a bomb. We’ve put together some tips to make your lives easier when planning the most important day of your life. No biggie. Here’s everything you need to make sure your special day goes entirely to plan. 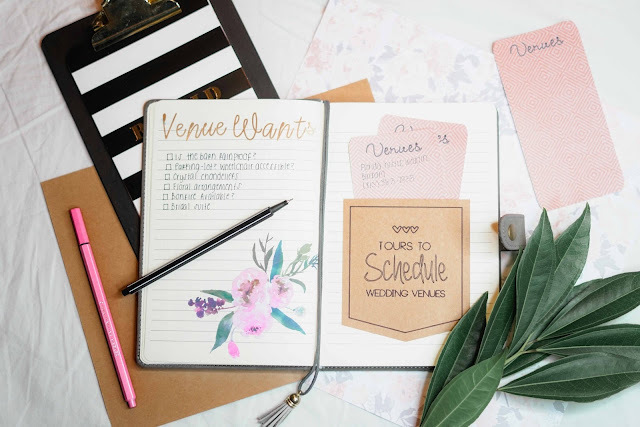 In place of a wedding planner (which will be out of the question unless you are millionaires, or friends with one), a wedding journal will prompt you with everything you need to sort out. They’re like diaries-slash-scrapbooks that you can keep all your dress fabric samples, company business cards, important telephone numbers and checklists in, all safe in one spot. When you first start planning, you should record all the important bits to sort out in the coming months so you don’t forget, and score off each one when complete. There’s a lot on your plate, so getting a wedding journal will help you keep track of everything and remind you of all the important details yet to be planned. Pinterest is the holy grail of wedding planning. There you will find inspiration for every tiny facet of your day. Don’t know what color to make your invites? Find your dream cards on Pinterest. Not sure how to do your hair? Search ‘bridal hair’ on Pinterest. Want to make some homemade table decorations? Pinterest has got your back. Start making your own ‘wedding inspo’ Pinterest board today… And no, you’re not crazy for doing this even if you’re not engaged yet. Every woman has one. You can never be too prepared, after all. Women’s blogs, mom blogs, and of course, wedding blogs will have content for all your nuptial needs. Think articles like ‘8 Original Wedding Picture Ideas’ and ‘5 Beautiful Bridesmaid Color Schemes’. Plus this article! Our favorite blogs are Big Kid Pants, for advice on everything wedding day, and LoveMyDress, for when deciding on a dress is the biggest decision in your life… which it is. It’s unlikely that you’re the first person you know who has ever got married – so one of your best resources should be your married mates. Ask them for advice for the best photographers in town, which wedding dress shops to stop by and which ones to swerve, and for advice on seating plans. Because seating plans are the unexpected bane of the entire day. Your married friends and relatives will be your shoulders to cry on when the reception band cancels with seven months to go (which is basically hours in wedding terms), and who will plan you the best ever bachelorette/bachelor party. They’ve been there, they know your pain! Not everything’s online you know – the physical realm still exists! Bridal magazines are still big news in the wedding market. Check out Rock n Roll Bride, for the alternative bride wanting a non-traditional wedding; Wedding Style for gorgeous inspiration from ceremonies around the world; and The Knot magazine to find ideas for your outdoor venue to your honeymoon destination. Another good idea is to peruse as many food, gardening, home, design and fashion magazines as possible too, to give you great ideas as to your dinner menu, venue décor and your wedding party’s outfits. Your mood-board can never be too big.